Leaf: generally tufted at vertical branch tips, 1.5--7.5 cm, linear or thread-like. Inflorescence: peduncles 2--20 mm; bracts 0.5--1 mm; pedicels 3--8, 1--6 mm. Fruit: 1.2--1.6 mm, elliptic or ovate, only marginal ribs rounded, thickened; oil tubes 5--6 per rib-interval. Chromosomes: 2n=44. Ecology: Intertidal marshes, streambanks; Elevation: < 36 m. Bioregional Distribution: s ScV, n SnJV, CCo (Inverness, Point Reyes), ne SnFrB. Flowering Time: Jun--Aug Note: Locally abundant; threatened by development, flood control, agriculture. 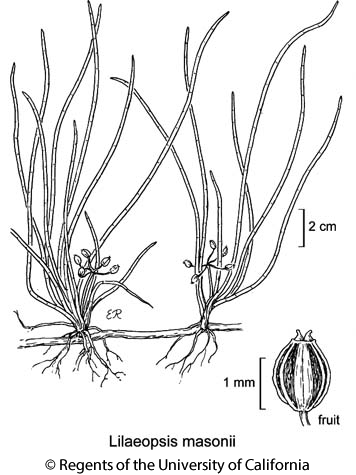 Citation for this treatment: Lincoln Constance & Margriet Wetherwax 2012, Lilaeopsis masonii, in Jepson Flora Project (eds.) Jepson eFlora, http://ucjeps.berkeley.edu/eflora/eflora_display.php?tid=30919, accessed on April 19, 2019.
s ScV, n SnJV, CCo (Inverness, Point Reyes), ne SnFrB. Markers link to CCH specimen records. Yellow markers indicate records that may provide evidence for eFlora range revision or may have georeferencing or identification issues. Purple markers indicate specimens collected from a garden, greenhouse, or other non-wild location.